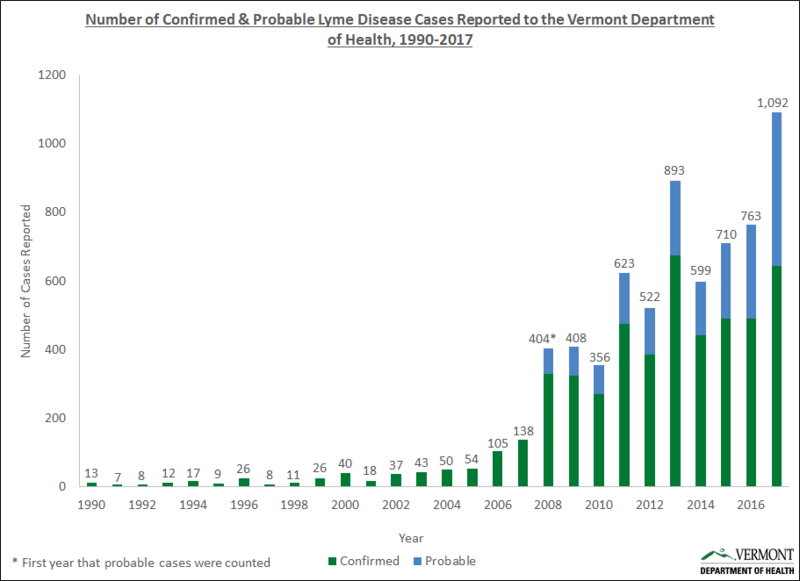 Lyme disease is the most commonly reported tickborne disease in Vermont and in 2016, Vermont had the second highest rate of reported Lyme disease cases in the U.S.
Lyme disease is caused by an infection with a bacterium called Borrelia burgdorferi. In the eastern U.S., Borrelia burgdorferi is transmitted to humans by the bite of a black-legged tick, Ixodes scapularis. In recent studies over half of the black-legged ticks collected in Vermont tested positive for Borrelia burgdorferi. The best way to prevent Lyme disease is to prevent tick bites. If you find a tick on your body, remove it quickly to reduce the risk of contracting Lyme disease. See a health care provider if you do get sick. Lyme disease is curable. Early diagnosis and treatment are important in order to avoid further health problems related to Lyme disease. While the EM rash is commonly associated with Lyme disease, not everyone with Lyme will develop a rash. 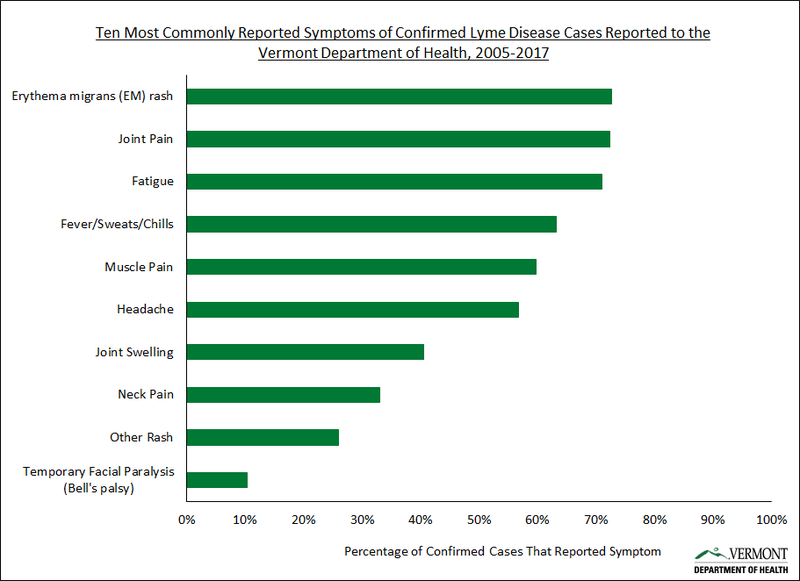 About 30% of confirmed cases of Lyme disease reported to the Vermont Department of Health do not have an EM rash at the time of their diagnosis. These cases reported joint pain and/or joint swelling at the time of their diagnosis more frequently than cases with an EM rash. These symptoms are relatively rare in Lyme disease cases reported to the Vermont Department of Health. Who is at risk in Vermont? Anyone who spends time outdoors can be at risk for Lyme disease. The tick that transmits Lyme disease in Vermont, the black-legged tick, can live in a variety of habitats such as wooded areas or fields with tall grass and brush. People who frequent these settings (hikers, campers, hunters, farmers, gardeners, landscapers, other outdoor workers, etc.) may be at increased risk of contracting Lyme disease. But it does not take a hike into the forest or a walk through a field to encounter black-legged ticks. The property around many homes can also provide a suitable habitat for ticks, particularly those yards that are next to woods or fields, or those with tall grass or leaf litter. That is why it is important to take the necessary steps to prevent tick bites. 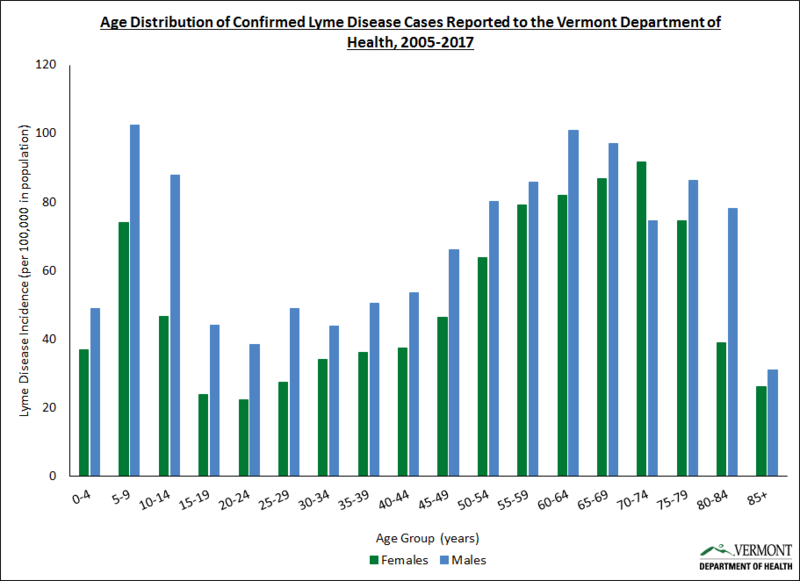 Vermonters of all ages get sick with Lyme disease, but data collected by the Vector-borne Disease Program suggests that males are more at risk for Lyme disease than females. Boys between the ages of five and 14 years appear to be at particularly high risk, as are middle-aged and older men. Many confirmed cases of Lyme disease are also reported in females between the ages of five and nine. The risk for Lyme disease among females increases around age 45 until it peaks for women in their early 70's. What Time of Year Are Vermonters At Risk For Contracting Lyme Disease? In Vermont, cases of Lyme disease are reported in every month of the year. However, the number of reported cases is lowest in the winter, gradually rises in the spring, peaks in June and July, then declines through late summer and autumn. It can take anywhere from three to 30 days from when the tick bite occurs to when symptoms of Lyme disease. Since most confirmed cases get sick in June and August, that means most cases are bitten by an infected black-legged tick between May and August. 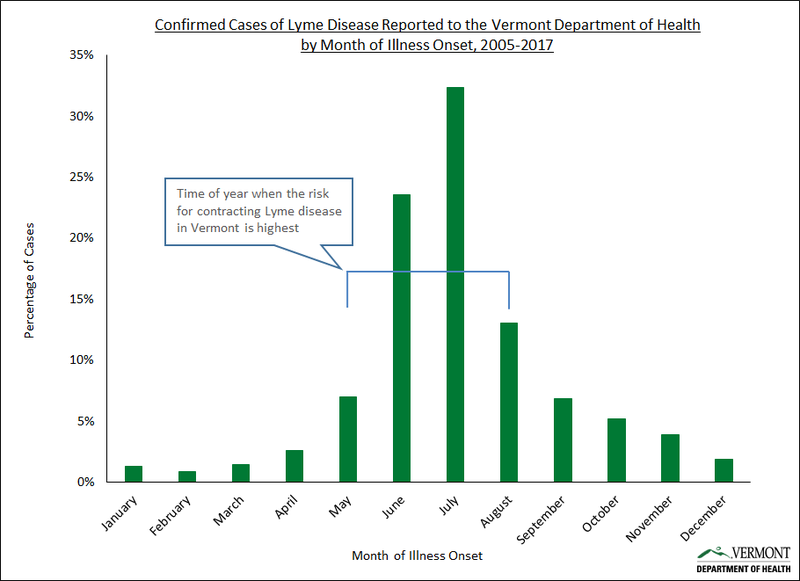 That is the time of year when Vermonters are most at risk for contracting Lyme disease. Where in Vermont are people at risk? Black-legged ticks that carry Lyme disease can be found all over the state. 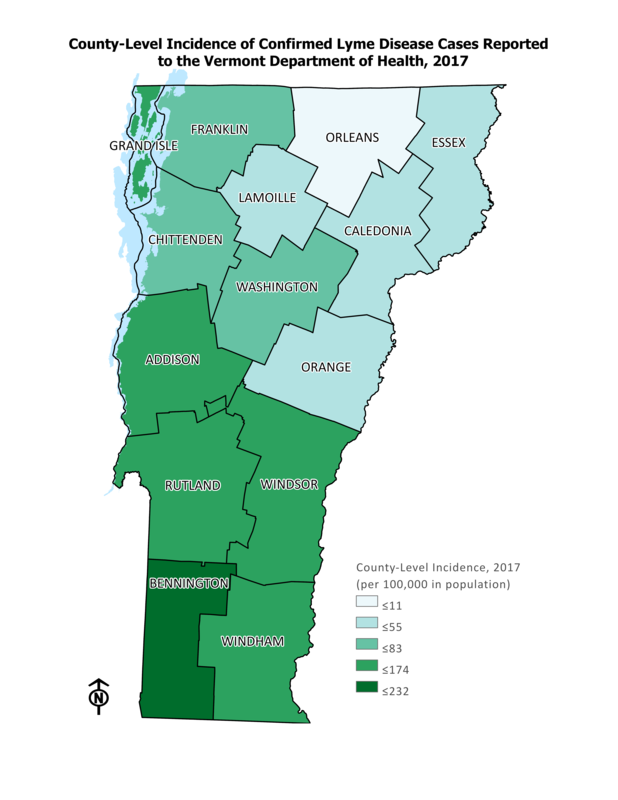 And while Vermonters in each county can be at risk for contracting the disease, the amount of risk can vary depending upon where you live in the state. The rate of disease is generally highest in the southern-most counties, and gradually decreases northwards. Reports of Lyme disease used to be a rare in occurrence in Vermont. In the early 1990's the Health Department would receive a dozen or fewer confirmed reports of the illness in Vermont residents. Since that time, the number of reported cases has increased substantially. It is now common to see well over 500 confirmed cases each year. Lyme disease can only be diagnosed by a health care provider. As part of an evaluation for Lyme disease a provider may perform a physical examination, review a patient's symptoms and evaluate their exposure history. A blood specimen may also be collected for laboratory testing. For more information, please visit the CDC's website on Lyme disease diagnosis and testing. Lyme disease can be treated with antibiotics. Most people who receive a timely diagnosis and begin treatment early in the course of their illness fully recover. Find more information on treatment for Lyme disease here. Some people may experience lingering symptoms even after being appropriately treated, a conditon called "Post-treatment Lyme Disease Syndrome". It is not clear why this happens, but it does not appear to be due to an ongoing infection with Borrelia burgdorferi. Find more information from CDC on Post-treatment Lyme Disease Syndrome. For more information on Lyme disease, visit the CDC Website. The best way to prevent Lyme disease is to prevent tick bites.